Symbolic ribbons of different colors are used as a sign of social attitude towards or as a means of attracting attention to a certain issue (e.g., the “Georgian ribbon” is a symbol of the Victory Day and a sign of respect to veterans). Everyone who shares the idea of the Movement has the right to wear such ribbons. The International Social Movement “THE MORALITY MOVEMENT” has chosen the white-and-blue ribbon as its symbol. The colors of the ribbon have a symbolic meaning. The color white: a natural symbol of light, the embodiment of purity and virginity, truth and goodness, mercy and spirituality. It embodies the Life itself. The color blue: a natural symbol of the radiant sky; it is synonymous to everything pure and high-spirited. It denotes high ideals, virtue and honesty. The combination of these two colors reflects the mission of the International Social Movement “THE MORALITY MOVEMENT” – to promote high morale and virtue in the society, to enlighten the people based on the spiritual ideals, in order to facilitate the spiritual revival of Russia and the entire world and to open a new opportunity for the development of the entire civilization. This flower is loved by many around the world. It is said that the lily has gotten its name from the ancient Celtic word “li-li”, or “whiteness” (“white-white”). 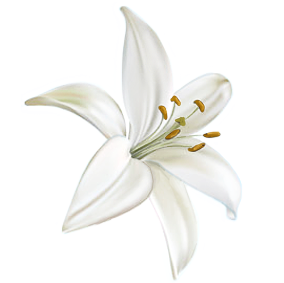 The lily was also used by the ancient Egyptians in their hieroglyphs, where it symbolized hope and freedom. Ancient Jews treated this flower with great love and as a symbol of virginity. In the Roman Empire, coins were decorated with the image of a lily, and lily chaplets were worn by the newly-weds. For the French, the lily has an important historical meaning. It was the emblem of the royal power, and France was called the kingdom of lilies. In the Catholic world, Jesus Christ is often depicted with a lily that he is giving to saints. In this case, the flower symbolizes mercy. In Christianity, the lily means purity and virginity; it is the symbol of Mother Mary. According to the scriptures, Archangel Gabriel came to Mary on the Annunciation Day with a white lily in His hand. In old Russia, the lily was also a symbol of virginity and purity. The lily was also cherished there as a symbol of peace.